Last night I went to a tiny vegan cafe for plates of brown and odd-looking but tasty food with Elisa Camahort Page, one of the founders of BlogHer, and Cecily Kellogg of Uppercase Woman. (Cecily didn’t eat vegan food. She had had a steak earlier, being more of a meat-and-potatoes and less of a “something sort of made to resemble beef” type girl). We’re in San Jose, the heart of Silicon Valley, at BlogHer, a tech conference. The motherland. I feel right at home. Here in the valley, I am kind of tech-lite, where in normal life I am more techy than 90 percent of the people I meet. We talked and ate and then walked through downtown San Jose in the golden twilight to the Fairmont Hotel. As we stood in the elegant lobby next to dueling grand pianos, we were approached by a woman in a maxi dress who was practically jumping with excitement. “Are you bloggers?” she asked. “I’m at BlogHer and I’m looking for bloggers and just getting a little drunk!” she said. She told us her name was Misty and she was from Calgary, Alberta, Canada. We told her our names. Elisa modestly held back from telling Misty that she was the COO of BlogHer. It was like peering through the looking glass backward to nine years ago, to my first BlogHer, and it was so cute and so dear that I got a catch in my throat to see it all over again. Before Misty had approached us, I had been trying to tell Elisa thanks for BlogHer and to express my admiration for this remarkable thing. Of course I ended up getting teary and not expressing myself well. It’s hard to express everything BlogHer is to me and the gratitude I have. I just remember that second year (the first year I went), with 300 people, sitting around the pool. At the book sale, there were one or two books people had written. There were mmmmmmaybe a couple bloggers in business with one another. Now I look over the past 10 years and see the successes. How many businesses has BlogHer launched? How many books have been written? How many creative projects have taken off? And all because of this remarkable container where brave, smart, enthusiastic women (and a few cool men) meet to encourage each other and to learn from one another. This is an amazing event. No wonder I’m verklempt. So welcome to all the enthusiastic newbies like Misty. And thanks again to Elisa, Jory and Lisa. I’m, for the seventh time, thrilled to be here. I wish both you AND Ed were here. You are so nice and smart and your hair is so pretty! I hope everything about this year is grand. I sure kind of wish I was there. At the very least just for the chance to squeeze your neck. But not in the “I want to kill you kind of way”. More like in the “I totally love you kind of way”. Love you, too. I have been thinking about you so much. Suebob, it was lovely to meet you! 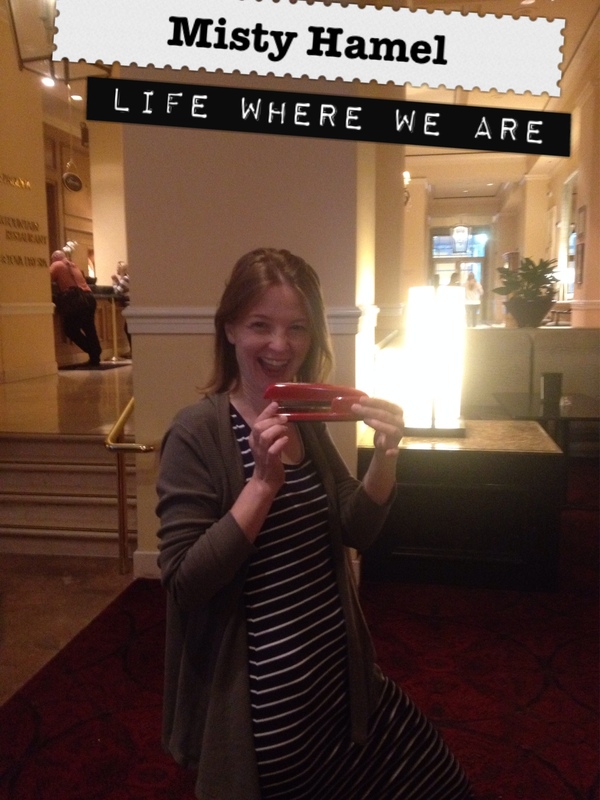 Thanks for the initiation/rite-of-passage pic with the red stapler and the kind words on your blog. 🙂 Hope you had as great a time as I did at Blogher! You were charming and funny and cute. And we WERE in a bar…albeit a very nice one.